Height: Male 26-28"; Female 24-26"
"The Doberman is an intelligent capable guardian, ever on the alert and ready to protect its family or home. It is also a loyal and adenturous companion. It likes to be mentally challenged, and is a gifted pupil. It is sensitive, and very responsible to its owner's wishes, though some can be domineering. It is generally reserved with strangers. It can be aggressive with strange dogs." 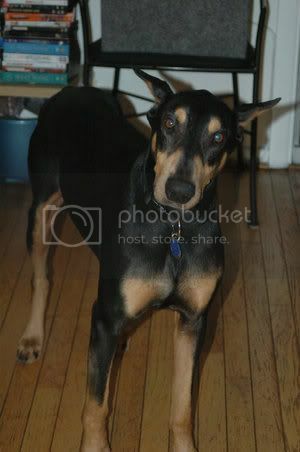 "The Doberman is compactly built, muscular, powerful, and square-proportioned. It combines elegance and strength, speed and edurance. Its carriage is proud and alert, and its gait free and vigorous. Its coat is short, smooth, and hard, showing off the exceptionally clean-cut lines of this athletic breed." "This is an active breed that needs daily mental and physical excercise lest it become frustrated or destructive. Its excercise requirements can be met with a long jog or walk on leash, or a strenuous run in a safe area ... coat care is minimal." "Few people can claim to have had so great an impact upon the dog world as Louis Doberman of Thuringen, German. Doberman was a door-to-door tax collector who needed a watchful guard dog to accompany him on his rounds. In the late 1800s he set about to create an alert streamlined guard dog, most likely by crossing the old German Shepherd and German Pinscher, with later crosses to the Black and Tan Manchester Terrier, Greyhound and Weimaraner ... the Doberman soon found favor throughout Europe and America as a police and guard dog, and later as a war dog. Its prowess in these areas soon brought more admirers, and the Doberman quickly became a valued family protector."